Yes, winter in Chicago can be tough. But that doesn’t mean you should spend your time indoors waiting for the thaw. You may have to wear a few more layers, but you’ll find the winter is a lot more fun when you embrace it. You don’t even need to hop a plane to the Rockies. Here are seven outdoor activities that will put a smile on your face during the cold and gray days of winter in Chicago. Yes, Chicago is known for its flatness. But that doesn’t mean you don’t have options when it comes to winter fun, especially with the kids. In the city, Cricket Hill sticks out among the soccer fields near Montrose Beach , offering a short but fun ride. Soldier Field also has a surprisingly large man-made hill that’s very good for sledding—a lot of dirt was moved when the stadium was renovated. A longer option for older kids (and parents) is at Caldwell Woods, 6200 W. Devon Ave., on the northwest side. 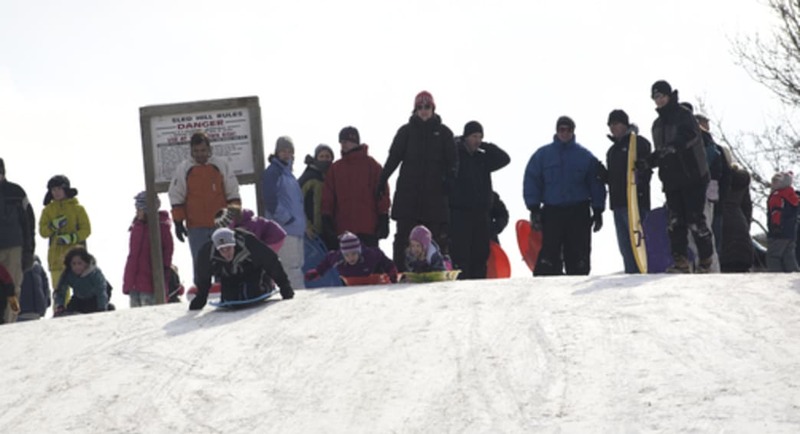 While the site once featured a toboggan run—removed along with all the others in the Cook County Forest Preserve system for safety reasons—the hill is still good for sledding. Plus you’ll find a warming center, fire pit, and indoor bathrooms. Dan Ryan Woods offers another long hill, which operates under the lights until 9 p.m. In the suburbs, Rotary Hill in downtown Naperville is a popular spot just south of the Riverwalk and within walking distance of lots of great places to eat. Unlike the free-for-all of sledding, tubing offers a bit more structure. Many ski resorts have added the sport as a cheaper option for families with younger kids who aren’t necessarily interested in learning how to ski or snowboard. At a resort you’ll also get a lift up the hill, which allows for a lot more runs with a lot less effort—and especially nice for parents who otherwise have to carry the sled and the kid back up the hill. In addition to its ski and snowboard amenities, Villa Olivia features a tubing hill with two runs and a magic carpet, a lift that resembles the moving walkway at an airport. It’s by far the easiest way to get your kids and their tubes back up the hill. Participants age 6 and over pay $20 for a two-hour window to ride (tube included). Wilmot Mountain, located just across the border in Wisconsin, features a giant tubing park apart from the ski area with 20 tubing lanes on the 1,000-foot hill. An enclosed conveyor belt takes riders back to the top in style and comfort. Hours are Monday through Friday from 4 to 10 p.m., weekends and holidays from 9 a.m. to 11 p.m. The cost is $15-$35 a person, depending on when and how long you ride. 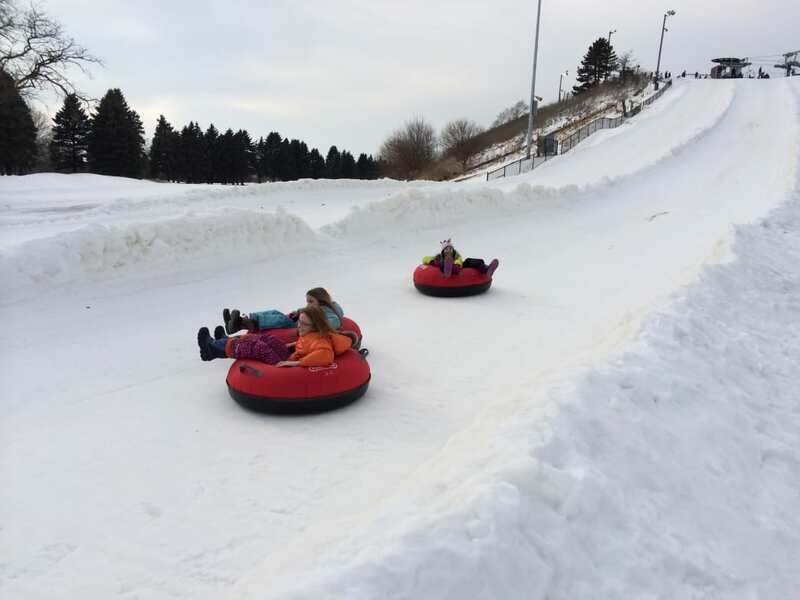 If you’re willing to walk back up the hill yourself, the Blackwell Forest Preserve offers an excellent tubing hill. You must rent the tubes from the forest preserve (for $5), but once you have the tub you can ride the 800-foot hill as many times as you like. At one time, cycling actually had an off season in Chicago. Or at least most cyclists took their bikes inside, hooked them up to trainers, and enjoyed their Netflix subscription. But more and more cyclists are discovering that it’s quite enjoyable to ride in cold and snowy conditions—if they’ve got a fat-tire bike. These off-road cruisers with their behemoth tires may look like something out of a cartoon, but they work. The tires, often more than four inches wide (more than double standard mountain bike tires), permit riders to take on all kinds of harsh conditions. The added tire size and lower air pressure allow the bike to “float” higher above the snow or sand and produce a great deal of grip. More and more Chicago-area cyclists are discovering the sport, and the bikes are now available in most bike stores. 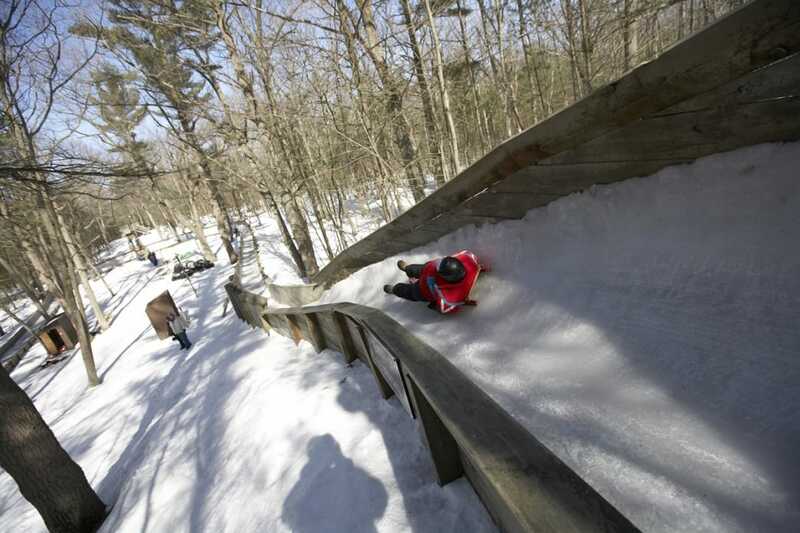 It may not be the state-of-the art track that you remember from Olympics, but the Muskegon Winter Sports Complex on the other side of the lake in Muskegon, Mich., is one of only three luge tracks in the United States. It’s smaller than the Olympic-level tracks, but that’s a good thing, making it accessible to the public. The 850-foot track consists of six curves and two starting areas. The public starts from about three-quarters of the way down the track and can reach speeds up to 30 mph. The track is designed for beginners and safe for those with no previous sliding experience. All equipment is provided, including the sled (one of four Austrian or Latvian luges), a sanitized helmet and forearm pads. Coaches will spend about 15 minutes before the run teaching you the technique, and then you’re free to sled as many runs as possible in your two-and-half-hour group session. The cost is $45 on the weekend, $40 on Friday nights. Lots of park districts and forest preserves offer ice skating in the winter. But you can get a unique outdoor winter experience at two ice-skating options downtown. The skating ribbon at Maggie Daley Park is unlike your typical oval rink. Instead it’s an iced path that winds around the park, offering excellent views of the city. It’s free to skate on the ribbon, and you can rent skates for $12. 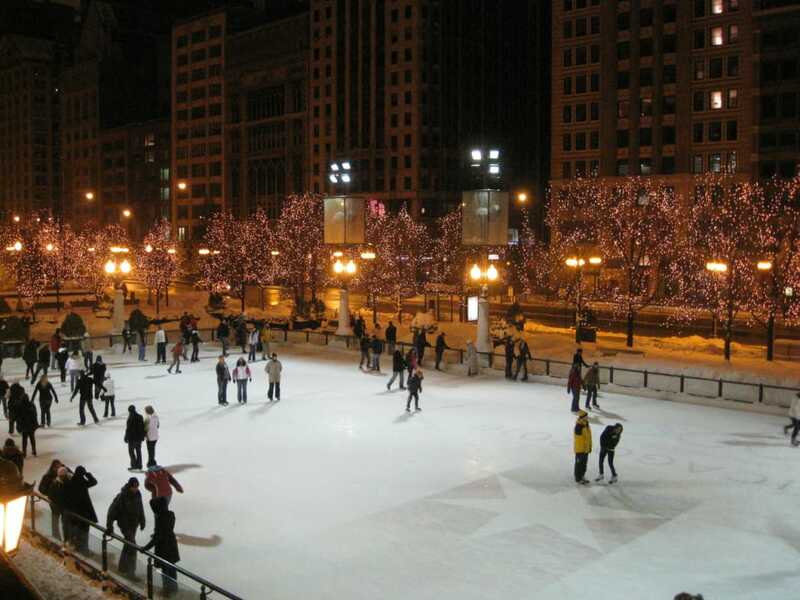 If you want a more traditional skating experience, the McCormick Tribune Ice Rink in Millennium Park is on Michigan Avenue, right underneath the Cloud Gate Sculpture, better known as the Bean. It’s also free with the same price for rentals. In the suburbs, the Morton Arboretum in Lisle features 1,700 acres to explore, and the vast majority of people simply do it by car. Which is a shame. Because the 16 miles of trails here are fantastic, offering a huge variety of flora to explore. The hilly landscape can be a challenge, especially if the snow is deep, so choose a route that’s in your comfort zone. Snowshoe rentals are available on weekdays from 10 a.m. to 4 p.m. and weekends from 9 a.m. to 4 p.m. The cost is $12 for two hours, $16 for all day, with a $2 discount for members. Children are $8/$12, with a similar discount. You do have to pay for an entry to the arboretum, but the costs are less in the winter. See the full pricing here . For a city that has a long winter and lots of snow—at least some winters—it’s surprising that there aren't more facilities like Camp Sagawau around. 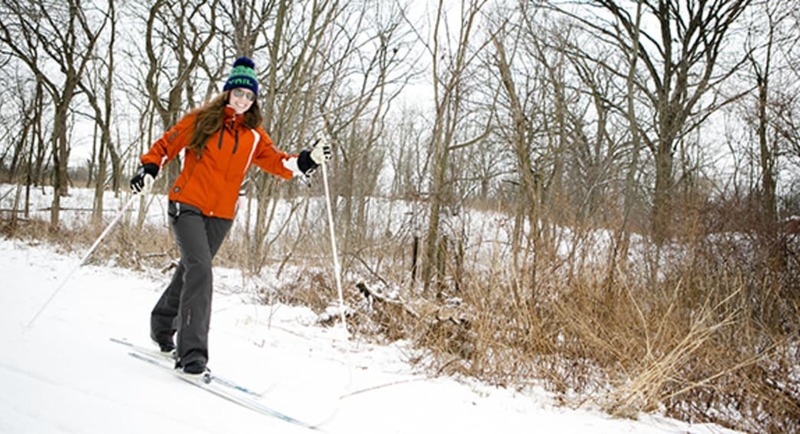 This Cook County Forest Preserve facility is located southwest of the city (near the Palos Trail System ) and offers a great introduction to cross-country skiing. It’s also one of the few places to learn skate skiing, for those who are interested in trying the aerobic-intensive sport. The facility offers rentals, lessons, and groomed trails to help anyone get started. For those more experienced skiers, the trail system includes a 1.3K trail that will offer a bit of a challenge. But Camp Sagawau is really about getting started in the sport and having a place where anyone can rent equipment and enjoy some time on skis. 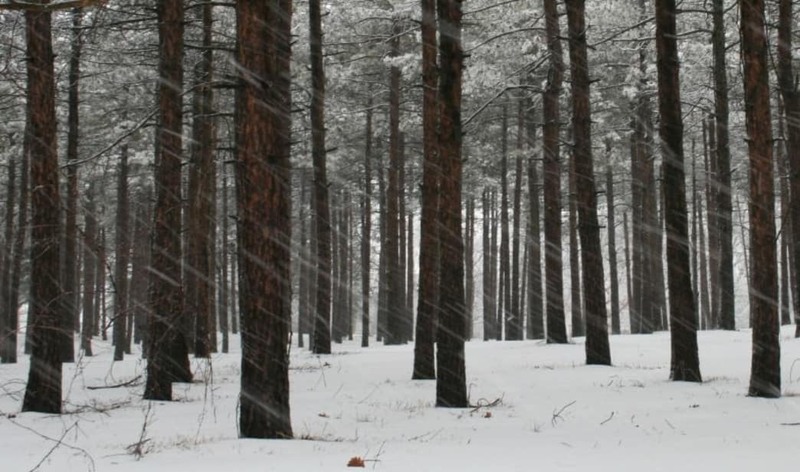 The area features just under 3 miles of groomed trails at the facility, which serves as a nature center in the snow-free months.